Dan R. Krauss/Getty ImagesSome Starbucks baristas say that mobile orders are cutting into their tips. Mobile ordering is on the rise. The number of orders being placed via mobile apps went up by 50% in US restaurants in 2017. While mobile orders can boost sales for restaurant chains, they can also cause behind-the-scenes problems and spark worker revolts. 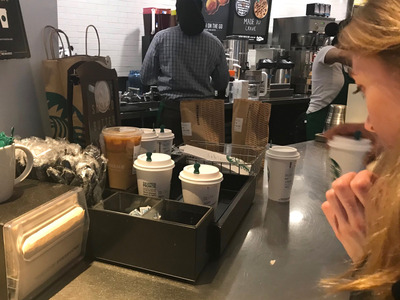 Some Starbucks employees say they’re losing out on tips because of the growth of mobile orders, while McDonald’s workers complain about the confusion mobile ordering causes. Mobile ordering is on the rise – and it’s creating a wave of new problems for fast-food workers. The number of orders being placed via mobile apps skyrocketed by 50% in US restaurants in 2017, according to data from the NPD Group. Business Insider Intelligence predicts that by 2020 mobile order-ahead will account for 10.7% of all quick-service restaurants (QSR) sales. However, while restaurants are increasingly banking on mobile orders to grow sales, there are behind-the-scenes conflicts that need to be addressed. Workers at chains such as Starbucks and McDonald’s say that the rise of mobile ordering is hurting their tips and complicating their jobs. And at a time when turnover is higher than ever in the industry, that could create some major problems. Kate TaylorStarbucks added a pick-up area for mobile orders in 2017. Last year, Starbucks witnessed the dangers associated with too many people placing mobile orders. In January 2017, the company reported that transactions – an important measure of customer traffic – dropped by 2% in part because of problems, such as bottlenecks and overcrowding, caused by mobile ordering. Starbucks has addressed the issues for the most part, adding pick-up shelves for mobile orders and changing some workers’ roles to focus on mobile-related tasks during busy hours. In February, Starbucks launched its first national effort in roughly five years to change how many employees should be working at different times of day and what exactly their tasks should be. Yet some workers say that one big problem remains. Apparently, more mobile orders can often mean fewer tips. Jaime Prater, a shift supervisor at a Starbucks in California, told Business Insider that tips were “in steady decline” because of the rise of mobile order and pay. A Starbucks spokeswoman said that the company encourages customers to tip baristas to show their appreciation. Tips aside, Starbucks is further along than other chains in the process of dealing with the practical issues that mobile ordering can cause for workers. Now other companies seem to be facing the problems that Starbucks faced in early 2017. Bloomberg reported earlier in March that some McDonald’s workers were being driven from the chain because of issues related to mobile ordering. While McDonald’s said that the chain’s turnover hadn’t increased, turnover across the fast-food industry has reached 150%, the highest figures since industry tracker People Report began collecting data in 1995. In other words, 2018 is not the right time to be provoking workers with attempts to boost mobile-order figures. In October 2017, The Wall Street Journal detailed mobile-order issues including overcrowding and drive-thru confusion at chains including McAlister’s Deli and Taco Bell. Part of the problem is that most chains haven’t yet introduced a unified system as technology has become more important. It’s a common problem across the retail industry. A recent report from Deloitte and Salesforce found that the average company uses 39 disparate front-end systems to manage consumer engagement, including point-of-sales, mobile, and social media. While the report focused on retailers, Robert Garf, vice president of industry strategy and insights at Salesforce Commerce Cloud, told Business Insider that the restaurant industry could draw similar conclusions about the need to connect various aspects of tech with workers’ existing roles. Garf’s concerns about unity echo similar theories from Panera’s Blaine Hurst. Hurst, who was heavily involved in the development of Panera 2.0 and was promoted to CEO earlier in 2018, said there’s a tendency for restaurants to view introducing mobile as an easy boost, without considering its impact on employees.